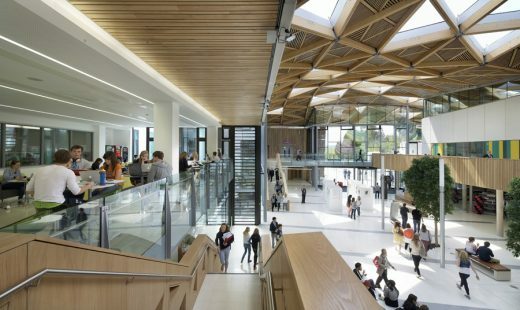 Her Majesty Queen Elizabeth II has officially opened the University of Exeter Forum; a spectacular new hub for students designed by Wilkinson Eyre Architects. 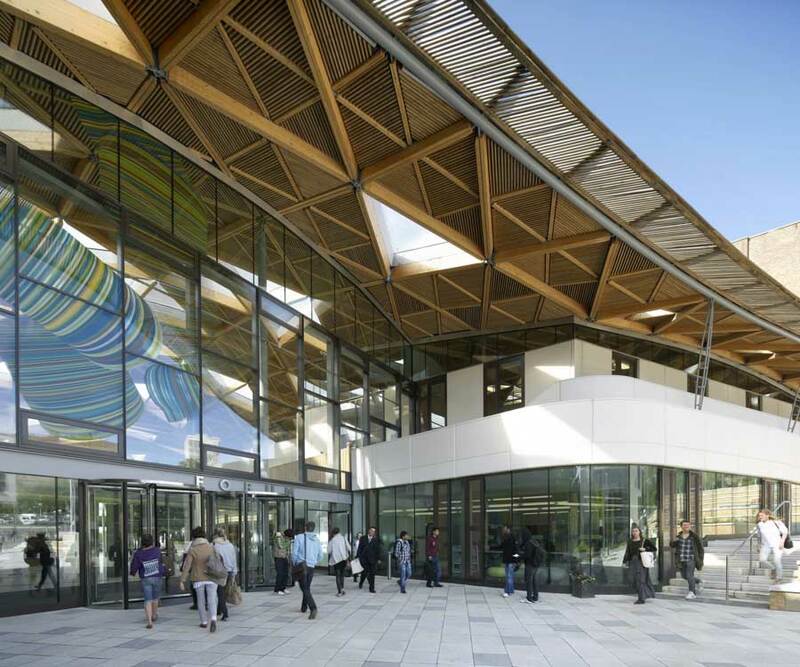 The £48 million project provides a new entrance for the University’s Streatham campus and houses new student facilities and teaching accommodation beneath a soaring timber-framed ETFE and copper roof. The Forum links essential facilities such as the Great Hall, lecture theatres and the Student Guild along a new galleried, indoor high-street, lined with cafes, a shop and a bank. A student services centre takes a prominent position within the new building, broadening and enhancing the range and availability of pastoral services that the University offers. 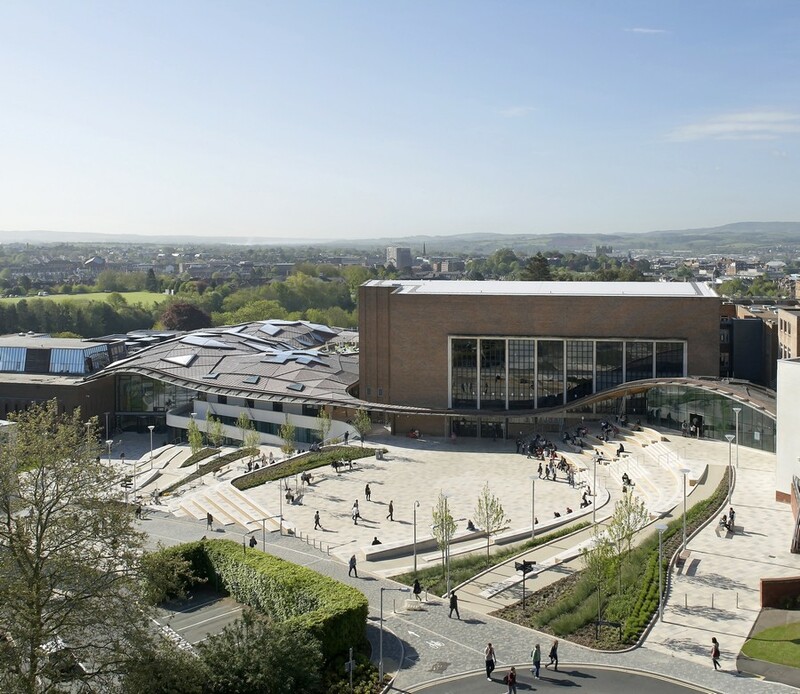 A newly built state-of-the-art 400 seat auditorium, specially commissioned public art, landscaped open spaces and refurbished library complete the Forum, making it the heart of the social and academic life of the University. 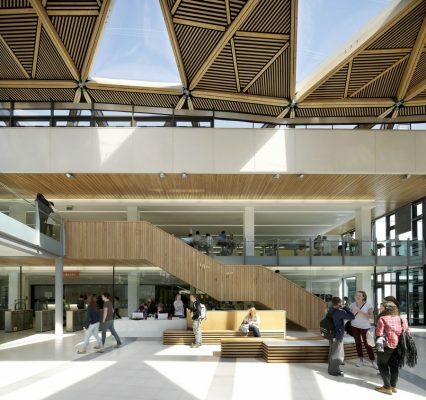 The completed Forum is the result of four years close consultation between Wilkinson Eyre and the University of Exeter that began when the practice won a design competition against five other practices in 2008. The Forum is a key milestone in the University of Exeter’s £350 Million capital investment programme, which supports a long-term goal to enter the list of the UK’s top 10 universities. Exeter was recently admitted to the prestigious Russell Group of leading universities. Wilkinson Eyre’s starting point for the Forum project was the natural features of Exeter’s famously hilly Streatham campus. The orientation and arrangement of the building and its adjacent landscaped piazzas respond to the contours of the hillside setting, which are traced by a “green corridor”; the main pedestrian route through the scheme. The steep topography of the hillside has been rationalized into two circulation levels that connect the Library and the Great Hall, unifying two vital centres once separated by a steep slope. A landscaped Entrance Piazza defines a new front door to the campus. Designed by the landscape architect Hargreaves, which has extensive experience designing public realm at the leading universities in the US, the piazza provides students with high quality open space for relaxation at the natural centre of the campus. Specially commissioned public art, by the glass artist Alexander Beleshenko, joins art from the University’s own collection on prominent display in and around the Forum. At the north western end of the Entrance Piazza stands a new entrance building that provides a reception area for the University and Great Hall. 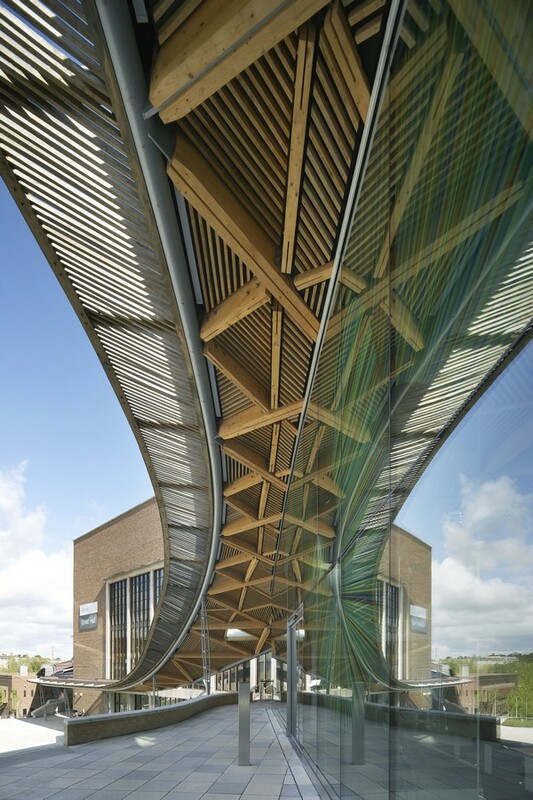 The smooth curve of the entrance building rises one storey, tracing the northern elevation of the Great Hall above a covered walkway before merging with the centerpiece of the Forum project: an undulating timber gridshell roof designed in conjunction with engineering experts, Buro Happold. Beneath the roof and behind the glass facades that enclose the space between the existing buildings, the Forum is an airy, galleried hall which shelters and unifies a series of new student-focused spaces. The upper level gives access to the Great Hall, Student Guild and a new suite of learning labs and seminar spaces designed for Harvard-style exploration sessions. The Forum’s vertical arrangement unifies the two circulation levels of the plan, creating new accessible routes that make the campus more legible and easier to get around. At ground level, the “green corridor” runs through the building, creating a covered high street with a bank, shops, cafes, breakout spaces and access to the library, student services centre and auditorium. The auditorium is a new building also designed by Wilkinson Eyre as part of the Forum project. Clad in brick, with a panoramic window punctuating the curving façade near its stepped base, the auditorium provides a 400-seat lecture theatre with state-of-the-art equipment and seating, and spectacular views out to landscaped lawns. The four-year construction project was managed to minimise disruption, with phases planned to avoid exam periods. The refurbishment of the university library, which took place as part of the Forum project was carried out floor-by-floor to allow full access to collections at all times. The Forum’s roof encloses 3,500 sq m of airy, column-free floor area making it one of the largest timber roofs of its kind. Its flowing form contrasts with the orthogonal brick architecture of the existing campus, responding to the hillside setting and preserving key views across the city to Dartmoor. Beneath the roof’s copper cladding, which will gracefully develop a verdigris patina over the next 15 years, lies an innovative hybrid timber structure. 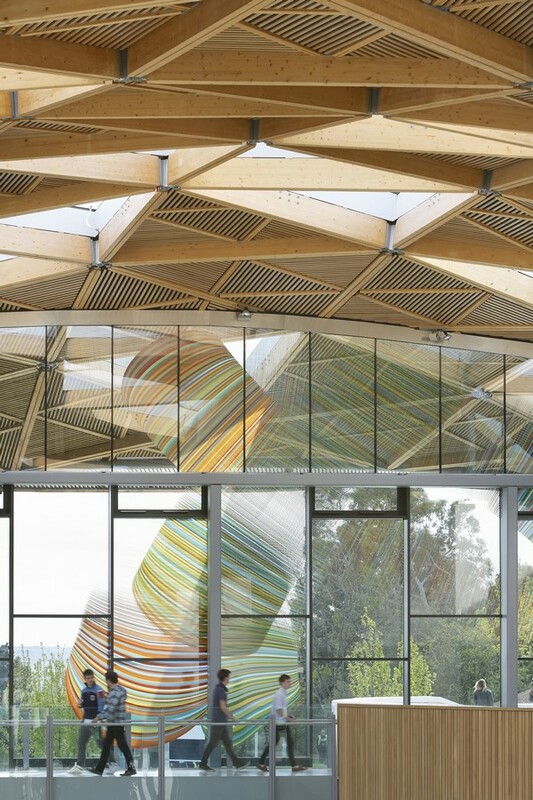 A matrix of timber members joined at steel nodes emulates the traditionally all-steel construction of a gridshell roof, weaving between the existing buildings of the campus. Wood was chosen as key material when research revealed that a botanical garden once grew on the Forum site before the University was built. The structural elements of the roof are Spruce timber, while kiln-dried Oak used is on interior finishes. The sinuous curves of the roof edge are finished in green Oak, which adapts readily to the shape. Wilkinson Eyre developed software in-house to enable the standardisation of parts for the technically ambitious roof; minimising variants, and therefore cost, despite the complex geometry. The triangular cells of the grid are either clad in copper, with oak-slatted acoustic baffling on the interior surface, or filled with ETFE pillows, which flood the lofty interior spaces of the Forum with natural light. Smaller panels of conventional glazing are used in the roof windows above teaching areas to mitigate any possible noise caused by falling rain. The structure of the roof was designed in conjunction with engineers Buro Happold, who consulted across a range of engineering categories including building services and sustainability. The Forum was designed to achieve a BREEAM “excellent” rating after the University identified that environmental performance has become key differentiator for an increasing number of undergrads selecting their University. 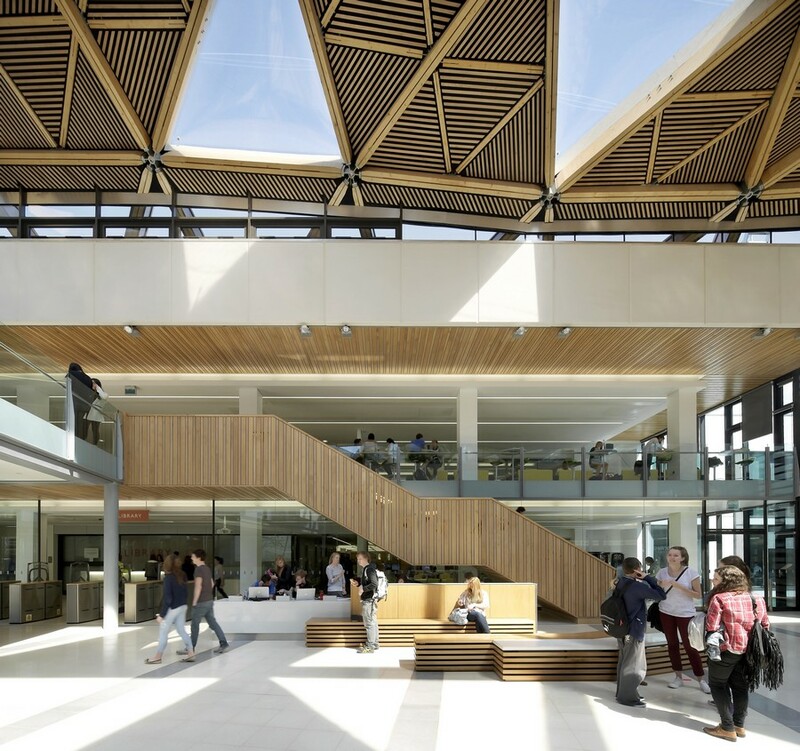 While the sustainability credentials of the timber structure and copper cladding are apparent, other features such as natural stack ventilation, a labyrinth pipe air-cooling system and energy efficient lighting maximise the environmental performance of the main building in use. The building was designed using SUDS principles, with water harvesting, grey water reticulation and new ponds and wetlands created to the south of the campus to assist in water attenuation. Low water-use fixtures were selected throughout the new project. Special care was taken during the design and construction process to preserve the valuable existing trees on site. Wilkinson Eyre’s proposals work with the natural features of Exeters famously hilly main campus, creating a green corridor connecting the Forum with the wider landscape. Central to the scheme is an undulating timber gridshell roof, which shelters and unifies a series of new student-focused spaces within. The fluid form contrasts with the orthogonal brick volumes of the existing buildings on this steeply sloping site, and respects key views across the city to Dartmoor. The Forum Project will feature an extended and refurbished Library, new learning spaces, student services, catering and retail outlets, a landscaped plaza and new University reception. The Forum is part of a 450 million capital investment programme which is designed to propel Exeter into the top 10 UK universities by 2012.